The Rough Guide to Paris begins with a ‘Colour Section’ on glossy paper consisting of an introduction, information on what to see and when to go, and twenty things not to miss. There are plenty of colour photographs as well as inserts on the Metro, the River Seine, and Paris climate. The names of monuments and sights are in bold so they are easy to spot. The twenty things not to miss include the obvious ones such as the Eiffel Tower and Notre-Dame cathedral, but also point out several lesser-known attractions, for example the hammam at the Paris mosque and art-house cinemas. Page references are given for each so that it is easy to find more details in the guide. The chapter entitled ‘Basics’ covers topics such as getting to Paris, city transport, money, health, special needs, crime, living in Paris and travel essentials. There is plenty of information on how to travel from the airports into the city as well as how to get around Paris itself by various means. Whether you want to report a theft, find an all-night pharmacy or make an international telephone call, helpful advice is given here on these topics and many more. The main section of the book is the ‘City Guide’ which is sub-divided into seventeen sections covering districts of Paris itself as well as the suburbs, Disneyland and day-trips from Paris. Each section includes two or three maps of the area concerned in orange, grey and white, as well as a number of black-and-white photographs. Information in each section includes an overview of the area, a brief historical summary, and details of the main monuments, museums, markets and other attractions. An entire seventeen-page section is devoted to the Louvre, with sub-sections for painting, sculpture, antiquities and decorative arts among others. There is a detailed insert for the Mona Lisa and another for practicalities such as opening hours and disabled access. This gives an idea of the amount of detail that the Rough Guide goes into. The section on day-trips from Paris includes Chartres and its cathedral, Giverny where Monet’s house and the gardens he painted can be seen, and Auvers-sur-Oise where Van Gogh spent the last two months of his life. Versailles and La Defense are among the features of the section on the suburbs of Paris. ‘Listings’ is an extensive section featuring accommodation, restaurants, music, theatre, kids’ Paris and gay and lesbian Paris among other areas of interest. Hotels, restaurants and bars, clubs and music are listed by district. Festivals and events are listed month by month and everything else is listed by type. This is a very detailed section of the guide that caters for a wide variety of tastes and budgets. Accommodation includes apartments, hostels and camping as well as luxury hotels. The sub-section on shops covers everything from bread to comics or perfume and gives details of the various markets in the capital along with a map. ‘Contexts’ gives a twenty-two page history of Paris broken down into sections, so if you were particularly interested in, say, Roman Paris or the Revolution it would be easy to find that particular passage. Following the history is a list of British and American fiction and non-fiction books on topics ranging from cookery to politics or photography. ‘Language’ concentrates mainly on useful phrases to use in restaurants but also includes more general language for asking directions, counting and booking hotel rooms. If food and drink are your main concerns this will avoid having to carry a separate phrase book, but for anyone on an extended stay in Paris who is not a fluent French speaker, a more detailed phrase book or dictionary would be a requirement. ‘Travel store’ is a comprehensive list of Rough Guide publications on a double page. Following this is ‘Small print’ and index. ‘Small print’ gives the history of Rough Guides as well as credits and acknowledgements for this particular guide. There is also a note on how anyone can write to or email Rough Guides giving information on updates to include in future editions. The index is an extensive one where you can look up any hotel, restaurant, bar and so on that you know by name rather than searching through the listings to find the page. The principal attractions and locations, for example Marais, St-Germain and Bois de Boulogne, stand out in the index as they are printed in orange. There are two individual colour inserts of four pages each. ‘Paris architecture – the shock of the new’ focuses on some of the capital’s most striking modern buildings such as the Centre Pompidou and the glass Pyramide in the courtyard of the Louvre. ‘From wine bars to three stars’ suggests a selection of brasseries, bistrots, wine bars and restaurants (including regional, international and haute cuisine). At the end of “The Rough Guide to Paris” are eight pages of colour maps, The first is a map of the whole of Paris on a scale of 1 cm to 1 km. It is not of course detailed but the ‘arrondissements’ are numbered and major buildings such as the Tour Montparnasse and the Sacre Coeur are indicated. The last map is one of the Paris Metro. The pages in between feature three double page maps of central areas of the city. They are very clear, but each one only features a relatively small area. Because of this, it might not be easy if, for example, you are arriving at the Gare du Nord and want to see how far it is to a hotel near the Eiffel Tower, as the two locations are on different pages. A larger map of the whole city would be useful; the Rough Guide does point out that a map of Paris is available free of charge at tourist information offices. I’m planning a short trip to Paris and may not actually take this guide with me as I am familiar with the city and will be on foot, therefore wanting to limit weight. If I were travelling by car or staying longer, I would not hesitate to take The Rough Guide to Paris with me. That said, it has already proved extremely useful for finding up-to-date information on places to visit, restaurants to consider, and travel by public transport. It is the first time I’ll be arriving at the Gare du Nord, and the guide even explains which way to turn depending on whether you want the Metro or the RER, or where to go to change money. As far as guide books go, it would be difficult to find a better one. 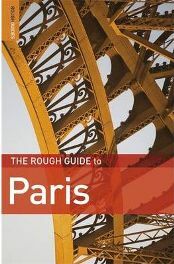 Unless you want a small, lightweight book to carry around or one with colour photographs on every page, “The Rough Guide to Paris” is an excellent choice for the sheer amount of detailed information it provides. A larger map of Paris and a more comprehensive phrasebook will be needed by some travellers, but otherwise everything you would wish to know will more than likely to be found here. No Comments on "The Rough Guide to Paris"